Miami Crime Simulator 3D is a first person shooter action game. You play as police guy who’s aim is to clear the Miami and Vegas city from crime. You can steal any vehicle you wish – auto, car, tank, helicopter, jet pack. The game contains fully Open world Environment. You can also buy a lot of things in a shop to help you complete missions and release the city from all sinners like a saint cop. You will be facing things like a mafia war, theft, mad traffic, criminal assassins etc. 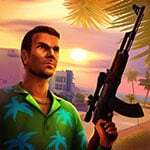 It is has the GTA genre style with 50 additive Missions. Enjoy and have fun. Miami Crime Simulator 3D Game is one of our Action Games at Round Games. It is also tagged as a 3D and Simulation game. To play even more free games, view our most played and all games pages. If you want to play more games like this game: Then you can simply check out the games inside the game tags that are the most relevant to your interests or check the Action Games category or check the related games section at the end of the game page. Also make sure to check out Fortnite Shooter Simulator Game, you may enjoy playing it.